Since I first arrived at State College one thing that surprised me was how many students smoke or use smokeless tobacco products. I’m from a small suburban town so rarely did I ever see individuals casually smoking in large public crowds, especially not teenagers. I have become so used to seeing people smoke cigarettes at State College that I’m starting to become numb to it, almost forgetting that it is an extremely dangerous habit. My whole life I have heard over and over not to smoke, and I’m sure everyone who does can say the same thing. We all know that it is dangerous, but just how dangerous is it for a growing teenager? Also, what other social, financial or psychological effects come along with it? 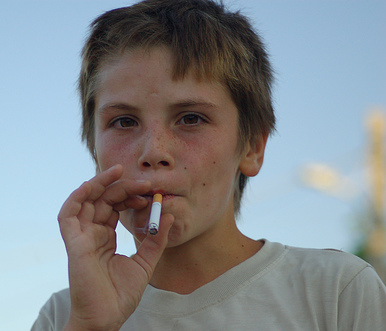 According to Smoke Free Teen, teenagers are much more susceptible to nicotine addiction than older individuals. Since the brain is still developing, only small amounts of nicotine are required to produce an addiction. The harsh chemicals contained in cigarettes alter the growth of a teens prefrontal cortex, which is the part of the brain responsible for critical thinking and decision making. Along with the brain, many other parts of an adolescences’ body are still developing that become affected by cigarette smoking. Nerve damage is extremely common in young smokers which could cause loss of vision or hearing later on in life. Smoking can also lead to increased heart stress, blood clots, inflammation of the lungs, belly fat, erectile disfunction, weakened immune system, and disrupted bone growth. All of these dangers only increase in younger smokers. By picking up this habit at such an early age, the younger generation is setting themselves up for medical complications as they grow older. It’s no secret that smoking is bad for your health. This is something we have learned our whole lives. However, i started wondering about the financial impact that smoking has on a Penn State student. 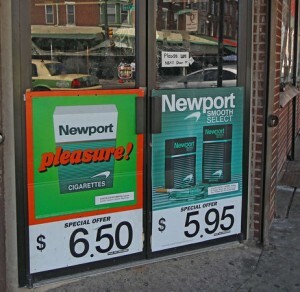 From walking around town and observing the advertisements for tobacco brands I concluded that the average cost of a pack of cigarettes is around $6. I also think it’s fair to assume that someone who has been smoking for a while probably goes through roughly one pack every two days, or around 10-12 cigarettes a day. 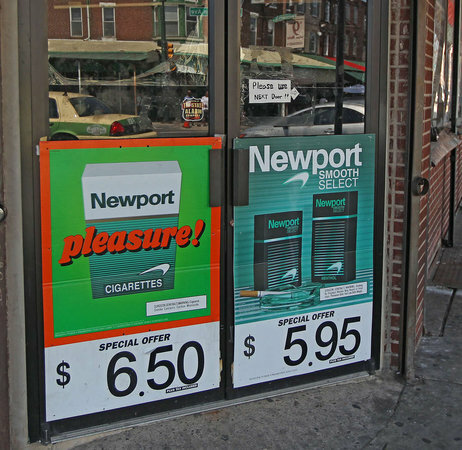 Given the average cost per pack and the average purchase rate for a smoker, it is fair to assume that they could end up spending around $1,100 a year on cigarettes. That is an absurd number, one that will only increase the more a person smokes. For someone on a college budget, $1,000 can make a huge difference in their quality of living. That amount of money could pay for someones books, feed them for a few months, or allow them to buy items necessary for a decent lifestyle. No matter how you look at it smoking is awful for you. The health impacts are devastating. Smoking is constantly one of the main causes of death in the United States. For a college student, smoking at such a young age can have costly impacts on the development of your mind and body. The financial impacts are just as bad, the habit is not only costly for your health but also for your budget. It is shocking that so many students continue to smoke despite the extreme risks. One thing is for sure, the more educated we are as a generation the less lives smoking will claim. This entry was posted in Uncategorized on September 13, 2016 by Connor Edward Opalisky. This post caught my eye because smoking is so relevant in today’s society. I do not understand why people smoke while knowing the horrible things it does to the human body. If you weigh the pros and cons the cons clearly win. I understand addiction, but why even smoke previous to being addicted. This article reaffirmed my beliefs. I was actually thinking the same thing. I have seen more smoking here in about 3 weeks than I have in my hometown. It is especially prevalent on Fraternity Row. I think it has to do with the fact that kids come from all over. They grew up in a different situation than we might have. It doesn’t make them bad people, it is just unhealthy. One of my friends is a junior here at Penn State. I saw him smoking and he quickly told me “don’t smoke, this is too addicting.”. I can understand that there is significant peer pressure at Penn State. There are a lot of people who do it and it is easily accessible. It is the first time that most of us are completely free from our parents. We don’t have to hide anything. Here is an article about college students and their smoking habits. Here is the article. I’ve lived in Philadelphia my entire life. In the city, it’s extremely popular for teenagers to smoke cigarettes on their lunch breaks, before and after school, whenever they have free time basically. Which I’m pretty used to. I’ve been exposed to people my age smoking cigarettes when I was roughly 13, I hung out with the wrong crowd in middle school so they always tried to peer pressure me to smoke cigarettes. Thankfully I always refused. There are so many downfalls to smoking cigarettes like lung cancer(like we’ve talked about in class). My cousin lives in Australia and she said that packs of cigarettes over there costs roughly 18 US dollars. Not only like you said it is a harmful habit, it’s an expensive one as well. I’m also from a small town where I rarely see people smoking out in public. I never realized how much money people spend on cigarettes until reading this post. My grandma has been smoking since she was a teenager, so I can only imagine how much money she spent over the years. I found this interesting article (http://time.com/money/3676521/smoking-costs-lifetime/) on how people who smoke can spend up to $2 million on cigarette purchases in their lifetime. It’s crazy to think of all the things people could be spending their money on, but instead they’re using it for something so unhealthy. I completely agree with you. I can not believe how many students smoke tobacco on this campus. Maybe I am just naive because smoking was not very popular at my high school and where I am from, but I thought that smoking cigarettes and using tobacco was going out of style until I came here. Now I realize how many people are still using tobacco products, specifically cigarettes. I always knew smoking and lung cancer had a very high correlation (since Andrew has mentioned several times that we still don’t know that smoking causes lung cancer, I’ll say there is a correlation instead), but I never realized how many other negative effects smoking has on adolescence, but it all makes sense. I also think you make a very important point about the cost of smoking cigarettes. If they were to quit smoking, that is a whole semester of books and more that they could put that money towards. My family always tells my uncle that he could make payments on a new truck if he quit smoking. We even did the math and everything for him one year. Since he has been smoking since he was a teenager, he is now up to smoking about two packs a day, and that financially adds up very quickly. I wonder if more people knew how much money they could be saving if they would quit this habit more easily. I would think that as teenagers, where the addiction is not as strong and the need for money is at an all time high, this would be a completely logical reason to quit smoking.